This post is sponsored by AVA Grace Vineyards. Los Angeles may be known for sunny weather, but even though it’s generally beautiful year-round, summer is when the city truly comes alive. Beautiful scenery, delicious food and fun outdoor activities are everywhere regardless of the season, but there’s something extra special about enjoying them this time of year. The days are longer, the nights are warmer, and there’s a palpable enthusiasm in the air from tourists and locals, eager to soak it all up. It’s my favorite season, and each time it rolls around I’m reminded of why I feel so lucky to live here. One of my favorite ways to enjoy the city this time of year is with a picnic. Not only are there an endless amount of beautiful backdrops to choose from, but picnicking happens to be conducive to some of the city’s most unique attractions – like outdoor movies, concerts and beach days. Whether you’re a local, or planning to visit, I highly recommend adding a picnic to your summer itinerary, and I’ve included some suggestions below on how to make it happen. Hollywood Forever Cemetery – A cemetery might seem like the last place you’d want to picnic, but thanks to Cinespia’s outdoor movie screenings, cozying up under the stars to watch some of Hollywood’s best films is actually one of the coolest experiences, and one of my top recommendations for things to do in LA (I included it in this post as one of my favorite activities during the fall, too!). The Beach – Post up in Santa Monica or drive up PCH to Malibu for a sunset picnic at El Matador beach. If sand isn’t your thing, the Bluffs just above Santa Monica’s beach provide an equally stunning view of the coastline. The Getty Museum – The architecture alone is reason enough to visit The Getty, but the gardens and surrounding views are just as impressive. I recommend arriving for a late afternoon picnic and then taking advantage of their summer concert series. It’s a truly awesome experience, and admission to the museum and concert are both free! LACMA – Stop by LACMA on Friday evening to take advantage of their free Friday Night Jazz Series. You can picnic alongside the Urban Light installation while enjoying live jazz music from some of L.A.’s most well-known jazz musicians. Food – For a quintessential LA experience, skip the grocery store and head to one of the most popular delis in the city: Bay Cities. They’ve got an impressive selection of meats, cheeses and pasta salads, but there’s one thing they’re particularly famous for, and that’s their Godmother sandwich with “the works.” Grab a few sandwiches, along with a fresh loaf of bread and thank me later. 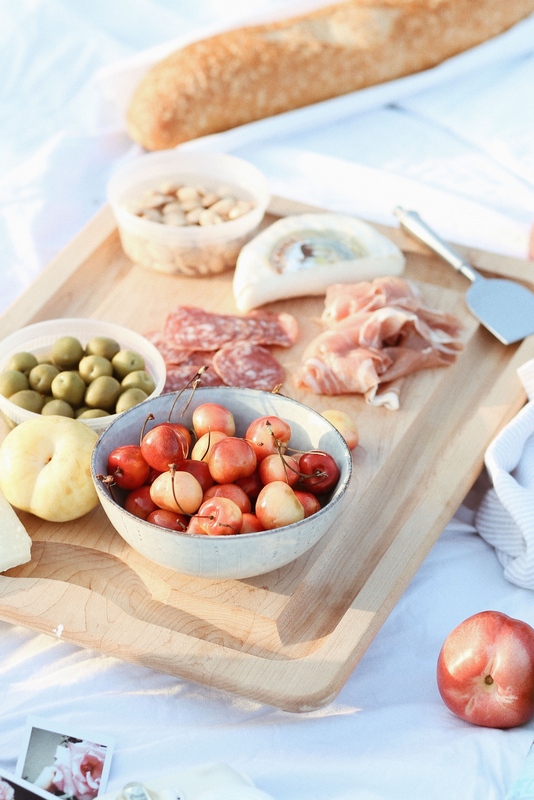 Wine – No picnic is complete without a great bottle of wine, and I love AVA Grace Vineyards Pinot Grigio and Rosé when it comes to complementing a picnic spread. Because wine preferences are so unique to the individual, choosing a wine to share can be intimidating, but both of these wines are extremely well-balanced and approachable, so you can confidently bring them into a group knowing they’ll be a crowd-pleaser. They’re light, crisp and refreshingly satisfying on a warm summer day. And the beautiful labels are an added bonus because they manage to elevate your picnic without any extra effort. I also love the convenience of the screw cap when it comes to picnics because there’s no complicated wine opener required, which is always appreciated when you’re on-the-go. A picnic basket – Fill it with your favorite snacks, games/books, a soft blanket and a camera to capture the experience. If you see any of the delicious AVA Grace wines, be sure to try them out (if you haven’t already) and let me know what you think! You can use the store locater here to find a retailer near you.